This Java program allows the user to enter three sides of the triangle. Using those values we will calculate the Perimeter of a triangle, Semi Perimeter of a triangle and then Area of a Triangle. Next line, we used mathematical formula to calculate the Perimeter of Triangle using the formula P = a + b + c.
Next, we are calculating the Area of a triangle using Heron’s Formula. Here Math.sqrt() is the math function, which is used to calculate the square root. This Java program allows the user to enter three sides of the triangle. We will pass those three values to the function arguments to calculate the area of a triangle. In this example, We declared the static function of double type with three arguments. Using those arguments, this function will calculate the area of Triangle. 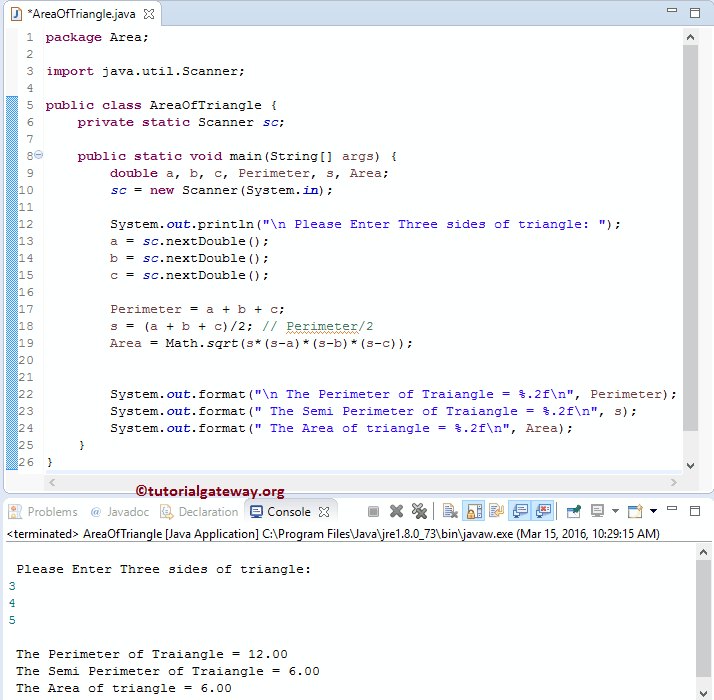 This Java program we will find the area of triangle using the triangle three sides. In this example, we are dividing the above example code using the Object Oriented Programming. To do this, First we will create a class which holds a methods.